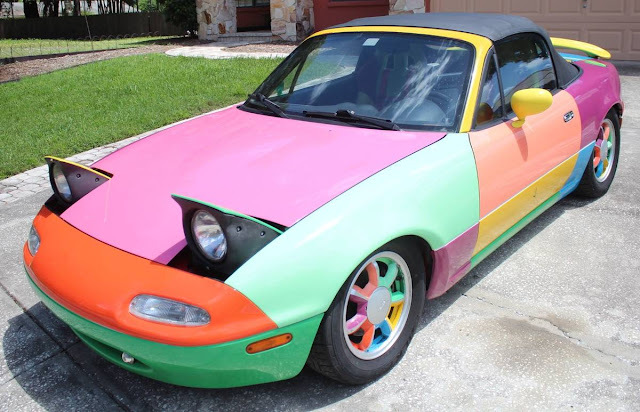 We all know the story of the multi-colored Harelquin Golf and what a commercial success that was...but did Mazda follow suit with a rainbow colored Miata? Nope, this is just the case of another seller with surplus paint and time. Probably shoulda stopped after huffing the first can. Find this 1993 Mazda MX-5 Miata offered for $3,900 in Land o Lakes, FL via craigslist. Tip from Rock On! 93 MAZDA MIATA WITH ONLY 60,000 MILES,SELL OR TRADE FOR conversion van,VW BUS,VOLKSWAGEN THING,VANAGON,BUG,BEETLE,CABRIOLET,CONVERTIBLE,CITROEN,FIAT,ALFA ROMEO,DELOREAN,PORSCHE,CENTER CONSOLE BOAT,PROPERTY,LAND,ACRES MOTORHOME,RV,ALUMINUM TRAILER,JUKEBOX,HARLEY OR OTHER TOY ????? Please note as long as this posting appears online, the vehicle remains available. Go to the Craigslist ad and check out the interior! It just proves that this guy huffed a can of every single color on this car. Wow, thanks for that tip. I think I am more impressed with the interior than the exterior. Paint is easy, but patched upholstery is a whole 'nother level. The weird thing is that I don't hate this (but I feel like I should...). But, but... the dashboard, console, carpet & door cards... they are so...normal. with all that work to upholster seats, seems the carpet at least coulda been altered with a modest collection of residential samples. 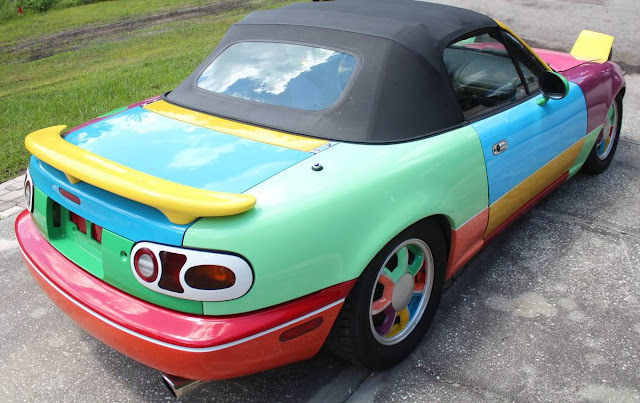 I have to wonder if the owner redid the seats to fit the theme, or found a screaming deal on those seats and decided the reasonable action was to paint the car to match. Harlequin always reminds of a 1980's hair band! I read and reread the ad hoping it was a wrap. I guess there is still hope. Keith Haring drew a bunch of falling babies on the headliner , but that was when he was sort of not a big deal and I abandoned the car when reverse gear stopped working. Strategically placed wallet almost steals the hair’s thunder. What!?! Incredible. Also, very cool you had an art car in 82. So hugh crawfors is Morrissey's alias? And he is on here chatting it up about cars? Awesome, Girlfriend in a comma! Perfect car for the Easter Bunny. My 2yo approves. All of those pastel colors makes a person wonder if the owner is driving an agenda.